Up until now, my writing on the mobile ecosystem has been focused on smartphones, because their adoption and sales dominated. Given the season of the tablet has started, I need to make some points about how tablets relate. Phones are not tablets and tablets are not phones. The market and business dynamics of phones are fundamentally and significantly different than those of tablets. Why? Because phones require a voice service, either pre-paid, or as subscription to be useful. Thus the primary channel for phones is carriers. This is more true in the US than the rest of the world, but it still generally holds. Phones are generally subsidized by the carrier and that subsidy is made up over the life of a (typically 2 year) contract. Tablets are useful without a voice connection. Some tablets are sold with embedded cellular data connectivity, and a subsidy, but the vast majority do not include anything but WiFi connectivity. Thus the primary channels for tablets are retail and online, not carriers. If you follow me to this point, you’ll agree the taxonomy picture above is phone specific. It includes Carriers but not other channels where devices are purchased by end users. When I first wrote my piece explaining how fragmentation of Android was good for Android but bad for Google I almost included Services as a specific market-side. However, at that time, service fragmentation was mostly just theory and I felt it would add complexity not required to make my point. Since that time Amazon has demonstrated how serious it is about building a competitor to Google’s app store and Apple kicked Google Maps out of bed. These examples and more mean we are going to see a significant amount of platform fragmentation along the services axis in the next year. I plan on writing my thoughts on why and how, thus I need to add Services as a key side of the taxonomy. End Users: Own the disposable income. Idealistically they drive the ecosystem; realistically they are slaves to marketing and advertising. Examples: Me and you. Channels: Own the sale of the device and/or service to the End User. Own billing. Own Sales. In the case of carriers, own the physical pipe. Because the money flows through them, they, effectively, are the primary owners of the customer relationship. They also are often directly responsible for the majority of the marketing. Examples: Verizon, Amazon.com, Best Buy, Apple Stores, iTunes, Windows Store. Device Manufacturers: Own the hardware. Own the industrial design. They hate not owning the customer relationship. But their HW bias (and manufacturing capex structure) prevent them from breaking out of this (there are no proof points of large hardware manufacturers becoming successful software companies). Examples: Samsung, Apple, Nokia, Microsoft (for Surface). OS providers: Own the core of the customer experience. Think they own most real innovation. They hate not owning the customer. In some cases, their core business models (search, desktop/server OS, office, …), means they are at the mercy of some middleman between them and the customer. Examples: Apple (iOS), Google (Android), Microsoft (Windows). Services: Own key components of the customer experience. Tend to be sticky. Examples: Apple Maps, Google Search, Xbox LIVE, Kindle Fire App Store. 3rd Party Developers: Deliver the most of the end-user benefit. Actually own most of the real innovation. They target platforms which have the greatest promise of ‘eyeballs’. Some care deeply about monetization features of the platform; others care more about distribution. They despise the inter- and intra-platform fragmentation that exists. This fall starts the season of the tablet. Between Apple’s rumored iPad mini, Microsoft’s Surface, the new Kindle Fires, new offerings from Samsung and other Android device manufacturers, and the coming onslaught of $100 tablets we are on the cusp of an explosion in the tablet space. It’s important that we have a common framework for understanding the dynamics of this ecosystem. I can’t control what taxonomy and lexicon YOU use, but I can try to be clear and consistent with mine. Hence this post. 1. Relative to Developers: What’s the difference between a Service and a “developer product?” Breadth of functionality, ability to be leveraged by third parties, ubiquity, user dependency? 2. Relative to OS Providers: Given the examples you provided, all of which are provided by a party which is also an OS Provider (okay, I know I’m stretching to call Amazon an OS Provider), and given your mention of the impending fragmentation along the services axis, will Services ultimately merge with OS Providers (that is, become OS services)? If not, what are some examples of Services which are provided by parties other than OS Providers? 1. Great question. I think it is a combination of ubiquity and user dependency (lock-in). Of course, this is highly subjective at this point in time. I’m biased in my thinking here, because I’m mostly focusing on the developer perspective, and the number one thing I hear from developers is the pain caused by fragmentation. I assert that fragmentation is going to get worse across all axes, but especially services. For example, Google already has a set of Play specific APIs. As a developer how do I use those and still work on the Kindle Fire? 2. I think it’s going to go the other way. Well, actually, some OS providers will TRY to fold them in (e.g. Apple Maps) and others will actively try to push theirs on other platforms (e.g. Xbox LIVE, Kindle Books). Social networks (FB, Twitter) are examples of Services which are not provided by (current) OS Providers. Services for most part are offerings by OS providers themselves. Amazon being an exception of course. To that end, for Kindle/Amazon devices, I consider Amazon as one of the sides (rather than Android/Google). @sfrocks:disqus, yes, this is really the core of the point I’m trying to make. Prior to Apple making it’s latest moves, Amazon further investing in it’s own App Store, etc… I was comfortable with viewing services as ‘features of the OS platform’. But I believe we are going to see an increasing amount of innovation, tension, and battles in services that run across many OS platforms and thus I think it’s time Services are called out. @ckindel:disqus I agree with your theory in general. I think what I am saying is that in case of a Kindle, Android is not a separate side to me anymore. It is there but a lot less relevant. Amazon owns the experience. So I’d simply replace OS Provider with Amazon/Service Provider in this case. In other words, I see little need to add another side in most cases. Either it’s an OS provider (like Android in case of Samsung Galaxy devices) or Amazon itself. As a matter of fact, Amazon is both an OEM and Service Provider in case of Kindle. But I can see how keeping players in separate categories (and therefore adding another side in the model) could help analysis. But it could also complicate things, and I personally am not convinced I’d want to use so many sides in my analyses. Totally understand why you want to do it though. Nice post. Awesome the way you’ve put the Kindel/Kindle thing to work! 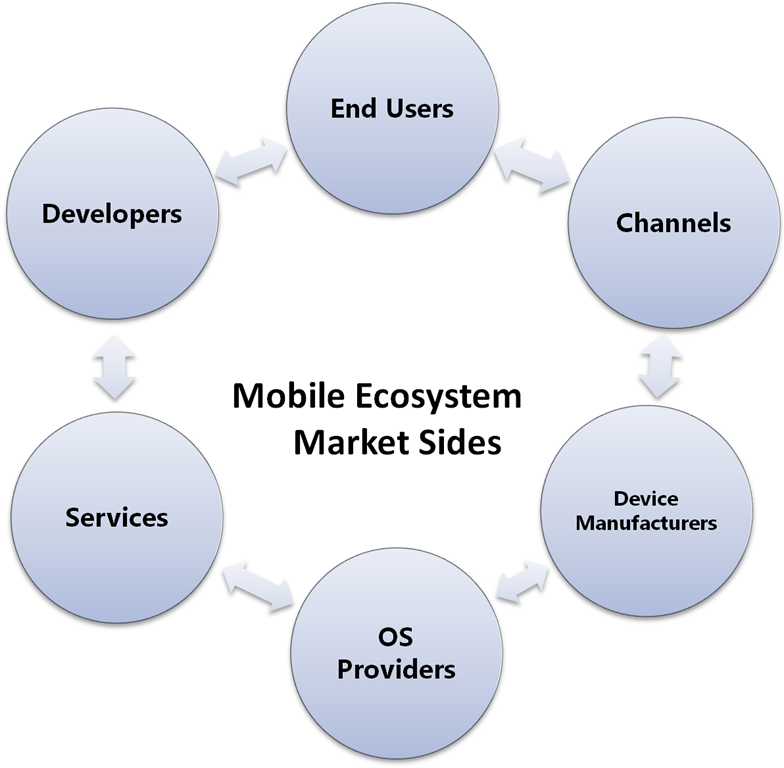 I really like the way it clarifies the mobile ecosystem. 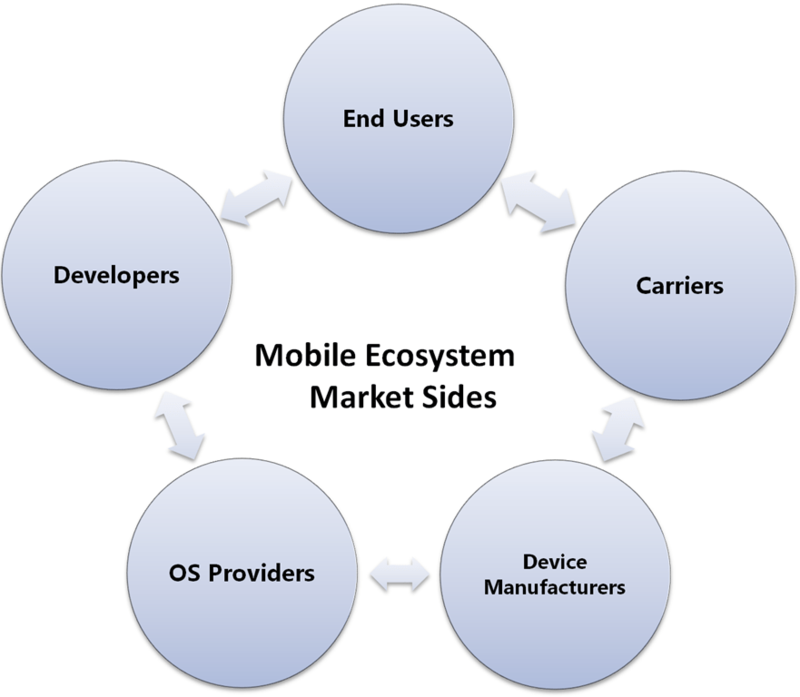 However, it seems that locally the relations between end-users/carriers/device manufacturer is not that clear. Let me try to explain. I’m leaving in France, and we had a fourth major mobile operator incoming early this year, with very aggressive price points regarding contracts. Interesting result of it, is that we saw here new low cost operators emerging, spinned of from the main operators. The price point difference is high at a point that if you compare on a period of one year or more, you can almost get an unlocked flagship of any device manufacturer for the same. I do think this tends to dilute the arrow between carrier and device manufacturer, and that it drives to add another line between end-users and manufacturers. Fascinating information Marc. I will dig further and ponder. Thanks! When you buy a Neuxs device directly from Google, you only see a 3 node graph with the OS maker, developers, and end user. Yes, this is called vertical integration. You’ll note that for Apple, this model dominates.